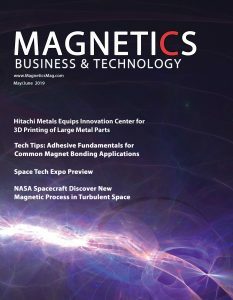 MB&T is a trade journal for technical professionals who integrate or utilize magnetic technologies in their products and applications, and for technical and management professionals in the magnetics industry. Readers are OEM engineers and technical professionals, product and application managers, and management executives who are involved in magnets, magnetic materials, magnetic products & components and electromagnetic technologies. The magazine is published quarterly in the Spring, Summer, Fall and Winter. MB&T magazine has a large distribution enabling advertisers to reach the entire magnetics industry and leading technical professionals involved in magnetics worldwide. In addition, each issue can be viewed digitally. Advertisers are suppliers of magnetic materials, magnets, magnetic assemblies and components, test equipment and services, electromagnetic design software, specialized processing and manufacturing equipment and supplies, and product development services.